BUSAN, May 26 (IPS) - The Global Green Growth Institute (GGGI) presented the African model of a National Financing Vehicle in which the governments of Rwanda and Ethiopia have successfully promoted green growth and climate resilience, at an event May 25 on the sidelines of the annual meetings of the Board of Governors of the African Development Bank (AfDB) in Busan, South Korea. GGGI and AfDB signed a partnership to accelerate Africa's inclusive and sustainable green growth. 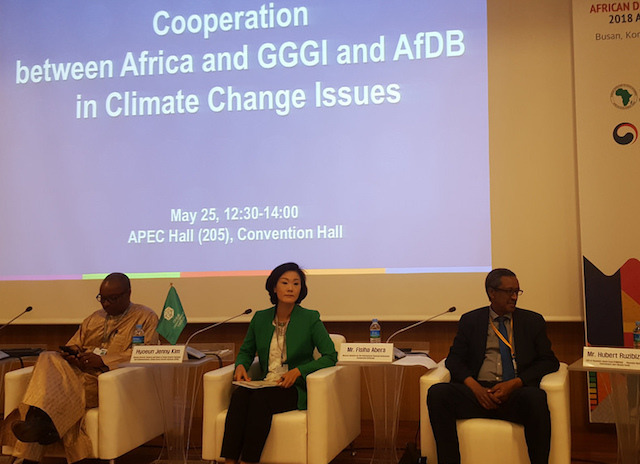 "We will focus on Africa, as we are seeing a huge potential in Africa," Hyoeun Jenny Kim, deputy director general of GGGI, said in her opening remarks. "So far, we've worked very closely and very extensively with Ethiopia and Rwanda throughout the comprehensive stages of designing and developing projects as well as mobilizing funds," she told IPS after the side event. "We've so far worked only with a small number of countries… But these climate funding success stories in Rwanda and Ethiopia encouraged us to extend our reach to other Africa countries like Senegal, Uganda or Mozambique," she added. After a two-year stint as ambassador to Senegal, Kim, who previously worked at the OECD, joined GGGI in May as its new deputy director general, in charge of planning and implementation of 33 projects in 25 countries. She emphasized the need for adopting locally relevant green growth paths in Africa, as well as mobilizing funds. "When I was working at OECD, I was seeing the agenda from a global perspective. , I have seen the unique and particular reality facing each African country. So I understand the need to adapt our climate resilience and green growth initiatives to fit the particular condition of each African country." The side event highlighted how Rwanda and Ethiopia have used public investment funding to bring aboard private sector investment with close cooperation with GGGI. Hubert Ruzibiza, CEO of Rwanda's Green Fund, revealed how Rwanda has successfully financed green growth and climate resilience through its National Fund for Environment and Climate Change (FONERWA), whose function is to identify and invest in the best public and private projects that have the potential for transformative change that aligns with Rwanda's commitment to building a strong green economy. The fund has created about 137,000 green jobs, rehabilitated 19,304 area (ha) of land against erosion, and made about 28,000 families connected to off-grid clean energy. "FONERWA has a global track record as the national financing mechanism by bringing together public and private sector investment," Ruzibiza noted. The side event also highlighted the GGGI-Ethiopia partnership to design, develop and implement Ethiopia's political commitment to CRGE (Climate Resilience Green Economy), as well as its national financing mechanism called the Ethiopia CRGE Facility, which is the country's primary financial instrument to mobilize, access and combine domestic and international, public and private sources of finance to support the institutional building and implementation of the CRGE Strategy. "As we are raising the green growth and climate resilient funding, especially from small and medium-sized business that constitutes about 90 percent of our business, so are the number of projects increasing," said Fisiha Abera, Director General of the International Financial Institutions Cooperation in Ethiopia. GGGI has been working closely with the government of Ethiopia since 2010 to omplement its CRGE strategy. GGGI supported CRGE to mobilize a 60-million-dollar grant from the Adaptation Fund (AF) and the Green Climate Fund (GCF), as well as another 75 million in climate finance. Most recently, GGGI helped mobilize 300 million dollars from the international private sector for the Mekele Water Supply Project. "The CRGE model shows the importance of the government's political commitment in which the government takes a holistic national approach. So our advisers are working closely with a wide variety of government functions," said Kim. The AfDB and GGGI signed an MOU on the sidelines of the African Development Bank Group's Annual Meetings in Busan to promote programs, conduct joint studies and research activities to accelerate green growth options for African countries, as well as to work together in the GGGI's cities programs and the AfDB's initiatives on clean energy, sustainable landscapes, green cities, water and sanitation, with the ultimate goal of strengthening climate resilience in Africa. The MOU was signed by Kim of GGI and Amadou Hott, Vice-President, Power, Energy, Climate and Green Growth, AfDB. Ban Ki-moon, who previously served as the eighth Secretary General of the United Nations, took office as President of the Assembly and Chairman of the council of GGGI on March 27. Headquartered in the heart of Seoul, GGGI has 28 member states and employs staff from more than 40 countries. Its areas of focus include green cities, water and sanitation, sustainable landscapes, sustainable energy and cross-cutting strategies for financing mechanisms. AFDB is Africa's premier development finance institution. It comprises three distinct entities: the AfDB, the African Development Fund and Nigeria Trust Fund NTF. Working on the ground in 44 African countries with an external office in Japan, the AfDB contributes to the economic development and the social progress of its 54 regional member states.